Most Americans aren’t waiting for doctors to support GMO labeling. We have been very clear; we want GMO labeling now, and we are even willing to go to court for it. Now, mirroring what millions of Americans have voiced over the past years, a leading network of doctor’s has voted on GMO labeling, and they overwhelmingly support it. SERMO currently consists of 358,000 members – all verified and credentialed physicians. For the moment, they represent doctors primarily in the United States and Canada, but the network is expanding to include a global community. Of all the doctors asked if GM foods should be labeled, a whopping 68 percent thought people should be given the right to know what is in their food – for obvious health concerns associated with genetically modified food. And of course the basic right to know what we’re really consuming. That means no biotech industry infiltration, except for the likely-visiting shills and trolls which infiltrate most social media. Reportedly, an honest discussion among medical professionals can be had at this network. 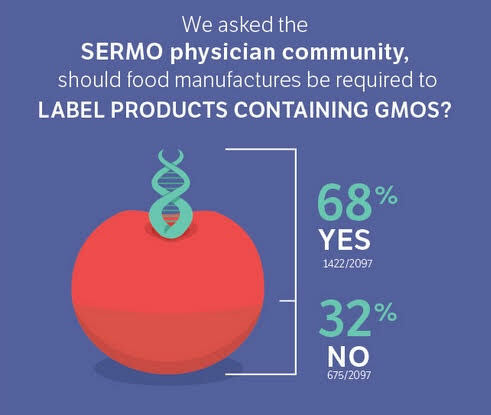 If that’s truly the case, the 68 percent who agree with labeling GMOs is even more significant, because it is a number which is likely more accurate than even the polls which found that 66+ percent of Americans wanted GM labeling, as reported by mainstream media. What’s more, in a recently published Nielsen study of 30,000 consumers, 80 percent of respondents said they would pay more for foods that indicate a degree of healthfulness, such as those labeled ‘Non-GMO.’ Do we really need more proof that people are turning their backs on biotech-altered poison crops? Even doctors desire GMO labeling – but you can bet the biotech industry will have a way to skew those facts as well. we also supply quality wax and Rick Simpson oil also available for the treatment of terminal cancer, diabetes, pain, eczema, depression, anxiety, and many other conditions. The world is waking up to the FAKE, HAZARDOUS killer NON-food produced by MonSatan. Won’t be long before we can bury them 100 ft under ground to Hell where they belong. I say they should vote to BAN GMOs outright. Forget labeling because they’re always going to cheat, LIE and steal from the people. For once mainstream medical opinion is right. But we also need labelling of toxic obstetrics, vaccines and psychiatry.